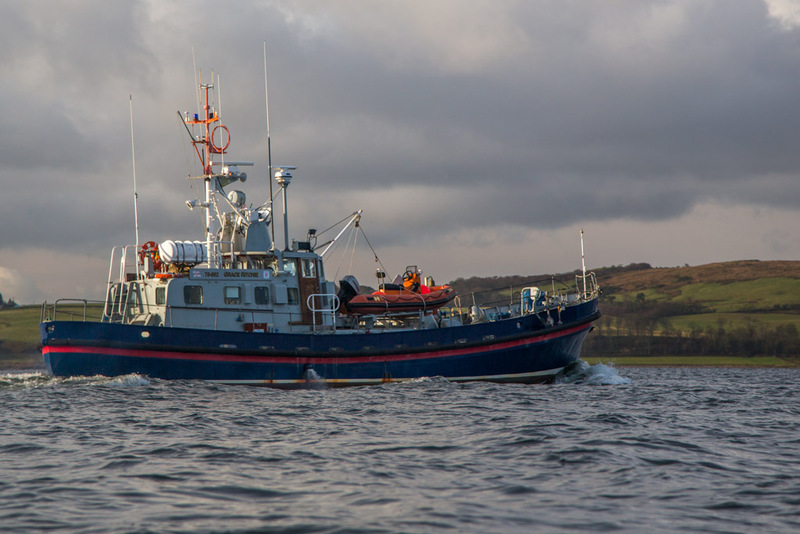 Just as we set off from Largs, the former RNLI lifeboat, Grace Ritchie 70-002, left her berth at the marina. 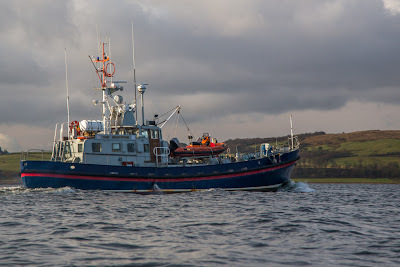 She is a steel hulled Clyde class lifeboat and was built by Yarrows on the Clyde in 1965. She is 70 feet long and weighs 85 tons. She is powered by two 230 BHP Gardner diesel engines giving her a top speed of just over 11knots. She is now privately owned but has a very interesting service history. In the winter of 1988/69 she was based in Kirkwall, Orkney for winter trials. On the tragic night of 17/3/1969 she launched together with the Longhope lifeboat, TGB, to help the Liberian steamer Irene, which was drifting out of control in the Pentland Firth. The two lifeboats entered the Firth, south of Ronaldsay, at the worst possible time. The race was running at 9 knots against a force 9 wind. At one point Grace Ritchie climbed a huge wave, broke through the crest then fell for nine seconds. Waves that night were estimated to be 60 to 120 feet high. She survived the giant waves but sadly the TGB did not and all eight aboard her died. Seven bodies were recovered the next day and their coffins were returned to the grief stricken community at Longhope aboard the Grace Ritchie. TGB has been restored and can be seen at the Scottish Maritime Museum in Irvine. As a water user I am pleased to be an RNLI supporter. The volunteer crews are prepared to risk their own lives to assist those at peril on the sea. In the UK and Republic of Ireland the RNLI operate a lifeboat service that is a charity, dependant on public donations. It is not a government organisation. Thank you to the brave volunteers.